Guest Speaker: Andrew Thomas of Brightseed Ltd.
Andrew Thomas pictured above, a Graduate of the School of Applied Computing, now a Successful Entrepreneur and Technical Director of Brightseed Ltd. located on the Mount Pleasant Swansea Campus, recently spoke with undergraduates at the School about Entrepreneurship and openly shared what it is like to create and run your own Company. Sharing many hints and tips along the way Andrew’s talk was very inspiring and part of the University’s Global Entrepreneurship Week (GEW) programme of events. Building on a strong technical experience gained within a large corporate environment, Brightseed was born out of the passion of providing a quality service to customers with a strong emphasis on a quality product and support. 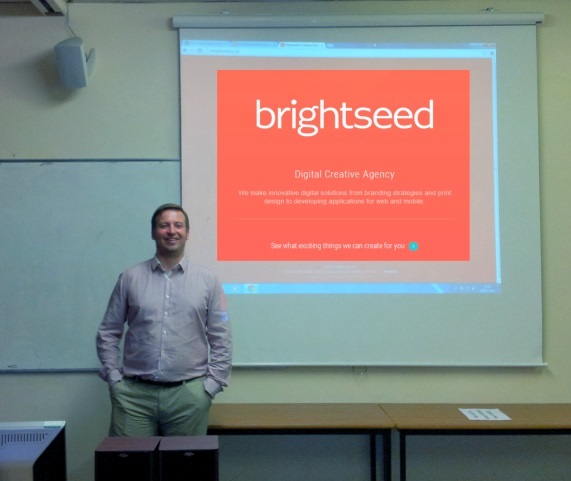 The partnership with a strong Creative talent (Simon Lee, Creative Director) has propelled Brightseed into a strong position. The University’s Global Entrepreneurship Week co-insides with News that the University of Wales Trinity Saint David’s place as a world-leading authority on enterprise and entrepreneurship education has been further enhanced as a senior United Nations (UN) official is set to spend the next four months at the University to learn about its work and to develop new educational approaches that improve international educational provision and inform new policy developments.